Predictably, enforcement of the idling-engines law is proving to be farcical. It has come to our ears that security trucks belonging to Guardforce and G4S are in the habit of lurking on Tung Hei Road, Shau Kei Wan , from its junction with Shau Kei Wan Main Street East to the traffic lights some 200 metres down the road underneath the flyover. This is an area with a number of schools. The drivers sit around eating, sleeping chatting meanwhile, keeping their engines running. So a complaint was made by Clear the Air chairman James Middleton to the Environmental Protection Department, which is supposed to enforce the new law. Back came a letter from the EPD to say it had had indeed found trucks with idling engines at this location. “Our observation was that they were providing armoured transportation services,” writes Ray Leung of the EPD, adding that they were therefore exempt under the law. It is hard to see what armoured protection services they were providing parked under a flyover. Our reporter tells us that as a result of the EPD’s enquiries, security vehicles no longer congregate at this location. They have moved and now gather around the Factory Street playground spewing their emissions. Yet another success story for Edward Yau Tang-wah, secretary for the environment. Friends of the Earth has proposed that the cost of disposing of refuse under any government waste charge scheme should be HK$1.30 a bag. It estimates that a typical family would pay HK$40 a month. The purpose of the waste charging scheme is to reduce the amount of solid waste generated in Hong Kong, as this is causing problems for our landfills, which are nearing capacity. The proposed charge may appear to be the solution to the problem, but I do not think it would be a fair levy. Everyone will have to pay the same flat rate and this will do little to deter people on high incomes. The average cost of HK$40 means nothing to them and it will not encourage them to generate less refuse. It would also be of no consequence to organisations that are huge polluters. However, it will be a financial burden for families on low incomes. That amount would be the cost of a typical meal for them. I am sure all of us want to see a reduction in the volume of solid waste that Hong Kong creates. Surely, those people who are the worst polluters should pay a higher levy. Hong Kong is very much a money-minded society. We need a scheme that gives people an economic inducement to cut back on the waste they produce. I am also concerned that unless a better scheme is introduced, we will actually see an increase in cases of illegal dumping of solid waste in Hong Kong. This is obviously a serious issue which must be addressed effectively. I hope that the government can come up with a better policy to deal with the environmental problems being caused by the levels of waste presently generated in Hong Kong. Exco’s approval of a third runway at Chek Lap Kok coincided with the release of a scientific paper showing increases in global atmospheric temperatures since 1998 to have been much higher than projected once Arctic measurements are included. This reflects a more rapid, unprecedented and ongoing increase in average global temperatures than at any time in the past 20 million years. The only plausible explanatory model we have for this increase is human economic activity. In the report (“Fuel prices may burn airline earnings, says Iata”, March 21) rising aviation fuel costs are mentioned as problematic in a declining market where they cannot be passed on to travellers. The cost of the third runway will be passed on to travellers, but in a declining market rising costs will further drive down demand. The illusion of continuous growth blinds many to this problem. Moreover, a third runway will do nothing to relieve crowding in the airspace over the Pearl River estuary. A third runway to “maintain competitiveness” reflects a mistaken naivety of thought we can no longer afford. Many readers may have missed the Organisation for Economic Co-operation and Development’s latest dire warnings of climate-related harm (“Future living standards ‘may already be doomed”’, March 17). Instead the broken record of “economic and population growth” will be constantly replayed by the baby-boomer generation and a compliant media, while the young will be left to deal with the looming ecological consequences. Though the evidence for anthropogenic climate change is stronger than that for Iranian nuclear weapons, we will continue to focus on the latter, while making excuses not to consider the former. After all, nothing can hamper economic growth – can it? Chemical engineers at the University of Massachusetts Amherst, using a catalytic fast pyrolysis process that transforms renewable non-food biomass into petrochemicals, have developed a new catalyst that boosts the yield for five key “building blocks of the chemical industry” by 40 percent compared to previous methods. This sustainable production process, which holds the promise of being competitive and compatible with the current petroleum refinery infrastructure, has been tested and proven in a laboratory reactor, using wood as the feedstock, the research team says. “We think that today we can be economically competitive with crude oil production,” says research team leader George Huber, an associate professor of chemical engineering at UMass Amherst and one of the country’s leading experts on catalytic pyrolysis. Huber says his research team can take wood, grasses or other renewable biomass and create five of the six petrochemicals that serve as the building blocks for the chemical industry. They are benzene, toluene, and xylene, which are aromatics, and ethylene and propylene, which are olefins. Methanol is the only one of those six key petrochemicals not produced in that same single-step reaction. “The ultimate significance of our research is that products of our green process can be used to make virtually all the petrochemical materials you can find. In addition, some of them can be blended into gasoline, diesel or jet fuel,” says Huber. The new process was outlined in a paper published in the Dec. 23, 2011 edition of the German Chemical Society’s journal Angewandte Chemie. It was written by Huber, Wei Fan, assistant professor of chemical engineering, and graduate students Yu-Ting Cheng, Jungho Jae and Jian Shi. The new production process has the potential to reduce or eliminate industry’s reliance on fossil fuels to make industrial chemicals worth an estimated $400 billion annually, Huber says. The team’s catalytic fast pyrolysis technology has been licensed to New York City’s Anellotech, Inc., co-founded by Huber, which is scaling up the process to industrial size for introduction into the petrochemical industry. In this single-step catalytic fast pyrolysis process, either wood, agricultural wastes, fast growing energy crops or other non-food biomass is fed into a fluidized-bed reactor, where this feedstock pyrolysizes, or decomposes due to heating, to form vapors. These biomass vapors then enter the team’s new gallium-zeolite (Ga-ZSM-5) catalyst, inside the same reactor, which converts vapors into the aromatics and olefins. The economic advantages of the new process are that the reaction chemistry occurs in one single reactor, the process uses an inexpensive catalyst and that aromatics and olefins are produced that can be used easily in the existing petrochemical infrastructure. Olefins and aromatics are the building blocks for a wide range of materials. Olefins are used in plastics, resins, fibers, elastomers, lubricants, synthetic rubber, gels and other industrial chemicals. Aromatics are used for making dyes, polyurethanes, plastics, synthetic fibers and more. Donald Tsang decision making – NIMBY Not in My intended Futian retirement Backyard Who cares the man made island will cost and extra 10 billion tax payer dollars but keeps the Heung Yee Kuk and Lau Wong Fat happy ! Hong Kong (HKSAR) – The Chief Executive in Council has approved the draft Shek Kwu Chau Outline Zoning Plan (OZP). “The approved OZP provides a statutory land use planning framework to guide development and redevelopment in the Shek Kwu Chau area,” a spokesman for the Town Planning Board said today (March 23). The planning scheme area covers about 150 hectares, including Shek Kwu Chau island and a proposed artificial island to be formed by reclamation to its southwest. The general planning intention is to protect the area’s high ecological value, to cater for the requirement for government, institution and community facilities and to facilitate the planned development of integrated waste management facilities on the reclaimed land while protecting the adjoining areas from encroachment by development. About 15.58 hectares of land are zoned “Government, Institution or Community”. Major existing facilities include hostels, workshops, a hospital, reservoirs, ancillary facilities of a voluntary drug treatment and rehabilitation centre and an anti-drug education centre. About 15.71 hectares of land will be an artificial island formed by reclamation. Of this, about 13.65 hectares are zoned “Other Specified Use” (“OU”) annotated “Integrated Waste Management Facilities” to designate land for waste treatment facilities, while another 2.06 hectares are zoned “OU” annotated “Breakwater”. About 89.64 hectares are zoned “Conservation Area” to protect and retain the existing natural landscape, ecological or topographical features for conservation, educational and research purposes. In addition, about 13.35 hectares are zoned “Coastal Protection Area” to conserve, protect and retain the natural coastlines and the sensitive coastal natural environment with a minimum of built environment. The approved Shek Kwu Chau OZP No. S/I-SKC/2 is now available for public inspection during office hours at the Secretariat of the Town Planning Board, the Planning Enquiry Counters of the Planning Department in North Point and Sha Tin, the Sai Kung and Islands District Planning Office and the Islands District Office. Copies of the approved OZP are available for sale at the Map Publications Centres in North Point and Yau Ma Tei. The electronic version of the plan can be viewed on the Town Planning Board’s website (www.info.gov.hk/tpb). Environmentalists, business groups and professional bodies disagreed yesterday over how Hong Kong should deal with its mounting waste crisis – especially whether, and when, incineration should be employed. More than 120 groups and individuals presented their views at a legislature hearing on the waste strategy outlined by the Environmental Protection Department. It includes building a HK$14.9 billion waste incinerator on Shek Kwu Chau capable of handling 3,000 tonnes of waste a day, and HK$8 billion to build more landfill dumps. Most participants supported charging households and businesses for waste disposal, which is currently the subject of a public consultation, but were divided over incineration. The prospect of a landfill dump close to their homes raised opposition from dozens of Tseung Kwan O residents. Environment Secretary Edward Yau Tang-wah defended incineration, calling it indispensable to the city’s strategy for dealing with rubbish, since landfills alone would not be sustainable. Hong Kong had raised its recycling rate to 52 per cent, which was better than London, he noted. But green groups argued against incineration, asking lawmakers not to approve funding for an incinerator until a volume-based charging scheme for waste was in place. “Once waste burning is given the go-ahead, all waste reduction and recycling efforts will go down the drain,” said Michelle Au Wing-tze, from Friends of the Earth. Greener Action’s Angus Ho Hon-wai described incineration as a “path of no return”. It was “putting the cart before the horse”, he said, since recycling had still received too little effort. Clive Noffke, from Green Lantau Association, said officials had a misplaced focus on getting rid of waste as fast as possible. They had neither the determination nor policies in place to reverse the undesirable consumption pattern that generated the waste. Residents of Cheung Chau – just five kilometres from the proposed incinerator – opposed it on the basis of technology concerns, environmental impacts and even bad fung shui. Wolfgang Ehmann, executive director with the German Industry and Commerce delegation, supported a combination of waste management approaches – including incineration and charging – because it would take Hong Kong 20 years to raise the recycling rate to more than 70 per cent, the level in Germany. Philip Fan Yan-hok, a standing committee member of Chinese General Chamber of Commerce and a director of China Everbright (SEHK: 0165) – the largest incinerator operator on the mainland – supported waste charging. However, the incinerator’s nearly HK$15 billion price tag seemed very high, he said. The Hong Kong General Chamber of Commerce said 60 per cent of its members backed incineration in a poll last year. Daniel Cheng Man-chung, from the Federation of Hong Kong Industries, said the city could not wait any longer for incineration. “Whoever can complete the incinerator the quickest should be allowed to do it,” he said. Engineering groups also backed incineration. The Hong Kong Institute of Engineers said it was a “sustainable” alternative, but should be the last option considered. The Association of Engineers in Society proposed creating an artificial island using rubbish, south of Cheung Chau, and using it for landfill and an incinerator. The Institute of Architects also backed incineration. 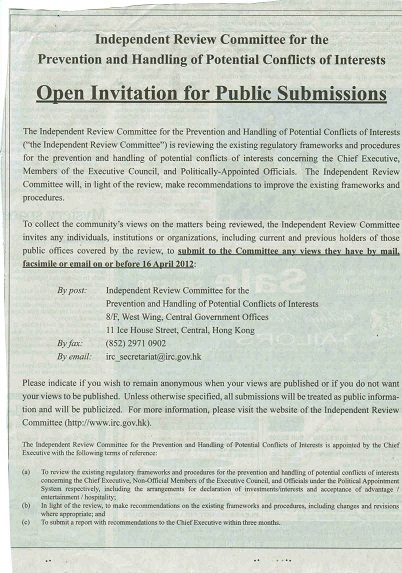 The Environmental Protection Department would like to respond to the letter by Angelique Tam, executive director of the Society for the Aid and Rehabilitation of Drug Abusers – Sarda – (“Incinerator would disturb residents of nearby rehab centre on Shek Kwu Chau”, March 23). Contrary to what was suggested by your correspondent, we have not disregarded the patients and staff at the rehabilitation centre on Shek Kwu Chau island. The centre has been identified in the environmental impact assessment (EIA) study as one of the sensitive receivers that has been assessed in detail in respect of the environmental impacts and the necessary preventive and mitigation measures to protect those living or working on the island. According to the EIA report, which is available on the department’s website, the predicted environmental impacts of the Integrated Waste Management Facilities Phase 1 project on the rehabilitation centre fully comply with all environmental criteria and standards. Before and since the completion of the EIA study, we have engaged Sarda and the local community. We have had discussions with representatives of Sarda on several occasions and replied to them to explain the impacts of the project and the design and control measures. We would like to assure Sarda that the project will be designed to meet stringent international standards and suitable mitigation measures will be adopted to minimise the environmental impacts. We will adopt good practices for the control of noise emissions, including the use of quiet plant and working methods and the use of noise barriers. Also, a community liaison group will be set up to maintain close communication with the local community during the design and implementation of the project. We invite Sarda to join this community liaison group. We would like to thank Sarda for its views and comments.